A BLINDING ULTRA OBVERSE! The reverse holds solid Cameo frost on jet-black mirrors for superb Cameo contrast, while the obverse features OUTSTANDING Ultra Cameo frost! The obverse devices are smothered in glowing-white snow, and sit on deep, pitch-black mirrors. Very clean and virtually flawless surfaces! 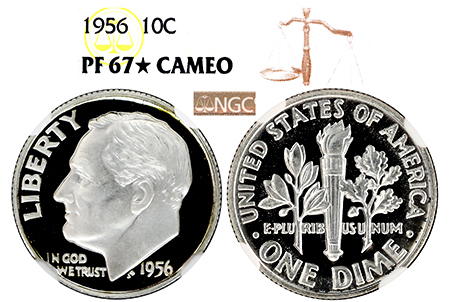 NGC has certified only 18 examples in PF 67 STAR CAMEO.